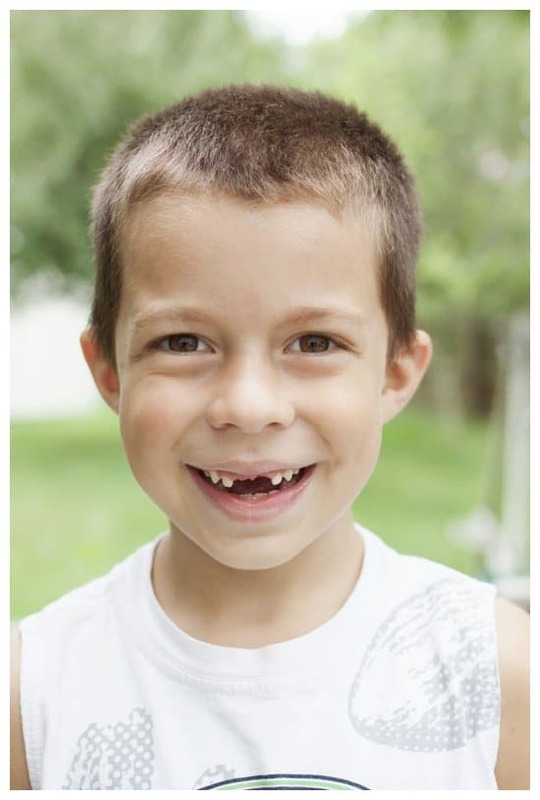 Michael lost both of his front teeth within a week of each other. The first fell out when he ran into the mats at gymnastics, and the second he bumped on his bunk bed. When the Tooth Fairy visits our house, you never know what amount of money she might leave. It is often a few quarters, but on occasion the children find a dollar in their tooth pillows. When Michael’s second tooth came out he said, “I know the Tooth Fairy is going to give me a whole dollar this time…that tooth was big and bloody!” Apparently he thinks the Tooth Fairy determines a tooth’s worth based on its size and gore, rather than what money *she* can find in the bottom of the diaper bag or junk drawer. As the kids grow, I find that some milestones I don’t expect to notice catch me off guard. When Michael smiled at me for the first time with his new toothless grin I had to walk away to hide my tears. From experience, I know that while that gap is there he will continue to look like a ‘little’ but once those teeth grow in he will be solidly in the ‘big’ category. For now, I will enjoy the adorable lisp the big gap creates. I will take a ton of photos to document his last months looking like a little boy. And I will hope those teeth take several long months to grow in!